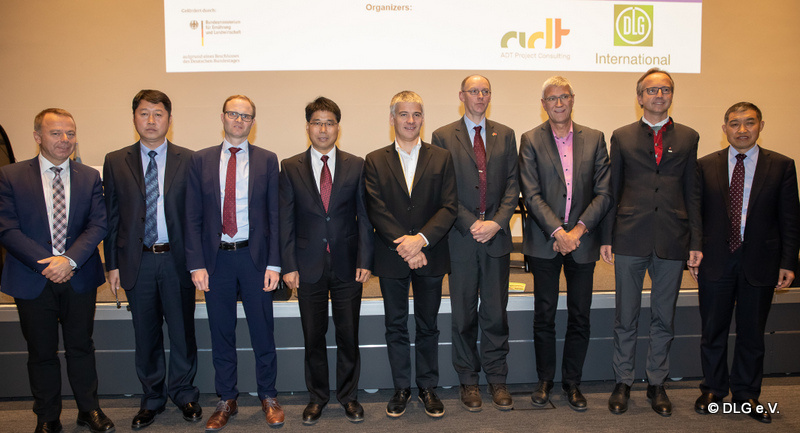 In course of the current policy on “Green Development” and “Qualitative Growth” in animal husbandry in China the German-Sino Cooperation Project on Animal Breeding and Husbandry in China organized a forum focused on “Challenges and Perspectives of Animal Breeding and Husbandry in China” which took place on 15th of November at the EuroTier 2018. The forum was initiated by the implementing agency of the project, ADT Project Consulting GmbH (ADT) supported by DLG International. The teamleader of the project, Dr. Sven Grupe, guided through the programme. After the welcome speeches of Dr. Ulrich Kleinwechter from the Federal Ministry of Food and Agriculture (BMEL) and Mr. Philipp Schulze Esking from the German Agricultural Society (DLG e.V. ), Mr. Zhenhai Yang, Executive Director of the National Animal Husbandry Service (NAHS) opened the subject by giving an introduction on sustainable development of animal husbandry in China on the basis of the “Green Development Policy” followed by different statements of German and Chinese experts involved in the livestock sector in China. Hereby, Prof. Dr. Friedhelm Jaeger from the Ministry for Climate Protection, Environment, Agriculture, Nature Conservation and Consumer Protection of North Rhine-Westphalia emphasized the strongly modified legal framework. Mr. Klaus Ferk from Röhren- und Pumpenwerk Bauer GmbH and Dr. Jochen Mentschel from Sano Holding – Bernhard Waldinger GmbH were representing German agro-industries engaged in China and highlighted their experiences in view of an increased demand for resource-efficient and environmental friendly production systems and the new business opportunities for European suppliers. Mr. Quanshui Yuan, General Manager of Yifa Animal Husbandry LTD. Co., Henan as representatives from the Chinese pig-industry and Mr. Ximing Wei, Head of the Institut of Reclamation, Harbin presented the viewpoints of Chinese livestock farms explaining their challenges to comply with the advanced requirements and to stay profitable under the current cost and price conditions. The event ended with a closing speech of Dr. Ferdinand Schmitt, Managing Director of ADT Project Consulting GmbH.